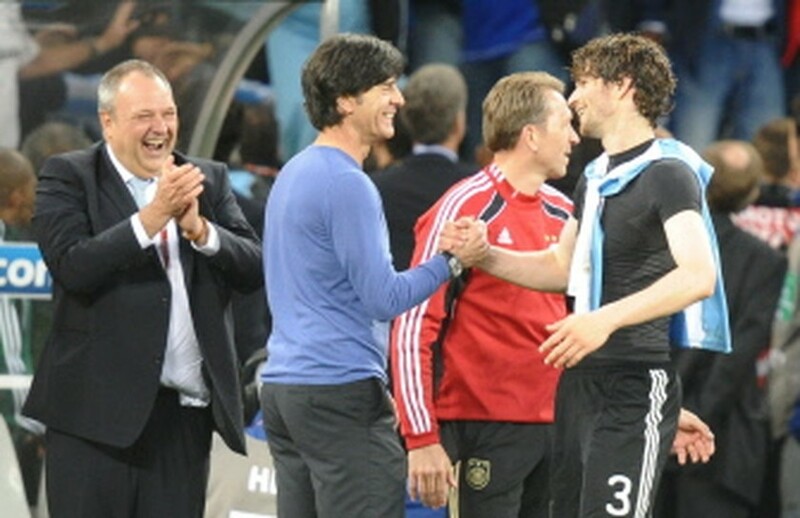 CAPE TOWN, July 4, 2010 (AFP) - He has tamed Fabio Capello's Three Lions, demolished Diego Maradona's dream and snuffed out Lionel Messi's magic, but can Germany coach Joachim Loew now inflict some World Cup pain on Spain? After routing Argentina 4-0 in Sunday's quarter-final, Germany face Spain in Wednesday's semi-final in Durban with a place in the July 11 final against either the Netherlands or Uruguay at stake. "My team showed great resolve, a great willingness to win and it wasn't just a high-level victory, but a true champions' performance," beamed Loew after Germany out-classed Maradona's Argentina. The 50-year-old's contract with the German Football Federation (DFB) expired last Wednesday, but if Germany are crowned world champions next Sunday, Loew will be able to name his price. A deep thinker, Loew has admitted to seeing a psychologist in the past and although he never got higher than Germany's Under-21 team as a player, he has won titles at club-level as a coach in Austria, Turkey and Germany. Like most of his squad before this World Cup, Loew was largely unknown outside of Germany, but his tactical ability and reading of the game has seen his side claim the scalps of two of international footballs giants. Having noted England's defence struggled for pace, Loew insisted on fast counter-attacks to allow pacey midfielders Mesut Ozil and Thomas Mueller to exploit the space at the back with devastating consequences for Capello's side. Against Argentina, Germany's tireless work in defence cut off Messi's supply of possession and without the ball to showcase his attacking brilliance, Loew's team reduced the world footballer of the year to a redundant midfielder. Even Maradona was humbled by Germany's performance on what he decribed as the 'toughest day of my life' as Bastian Schweinsteiger bossed the midfield and Miroslav Klose scored twice in the rout. Despite his low profile, Loew succeeded Jurgen Klinsmann as head coach four years ago and guided the Germans to the Euro 2008 final where they lost 1-0 to Spain in Vienna. He showed he can handle Germany's big-name stars during a player revolt in October 2008. First, reserve striker Kevin Kuranyi stormed out at half-time of the qualifying victory over Russia, bitter about a lack of opportunities, then captain Michael Ballack questioned Loew's commitment to his senior players. Ballack was brought back into line without losing face, while Kuranyi was simply told he will never play for Germany again while Loew in in charge. The key to Loew's success here has been his squad's fitness, allowing them to exploit the gaps in defences, blended with established senior players like captain Philipp Lahm, Klose and Schweinsteiger leading by example. To a man, the Germany squad -- with an average age of just under 25 -- has risen to the occasion. There were only glimpses in the warm-up games to the dazzling form produced in South Africa by rising stars Ozil and Mueller. Ironically, the blow of losing Ballack has transpired to be a blessing in disguise as the next generation have seized their chance. Likewise, senior forwards Lukas Podolski and Klose scored just five Bundesliga goals goals between them last season, compared to the six World Cup goals they have already scored here in just six games. Now just two more blockbusting displays could well see Loew's side claiming a fourth World Cup title for Germany.